Shanghai, China — Based on preliminary results, Asian Attractions Expo (AAE) 2016 attracted a record-breaking 11,500 total participants, including 8,100 buyers; and for the sixth consecutive year broke records for the size of the trade show floor and number of exhibitors; delivered information-packed education programs; and featured sold-out networking events at Shanghai-area attractions, including the new Shanghai Disney Resort. Asian Attractions Expo, which is organized by the International Association of Amusement Parks and Attractions (IAAPA), took place at the Shanghai New International Exhibition and Convention Centre, 13-16 June. This is the highest number of participants in AAE history and represents a 365 percent increase, when compared to the last time the Expo was in Shanghai (2006). 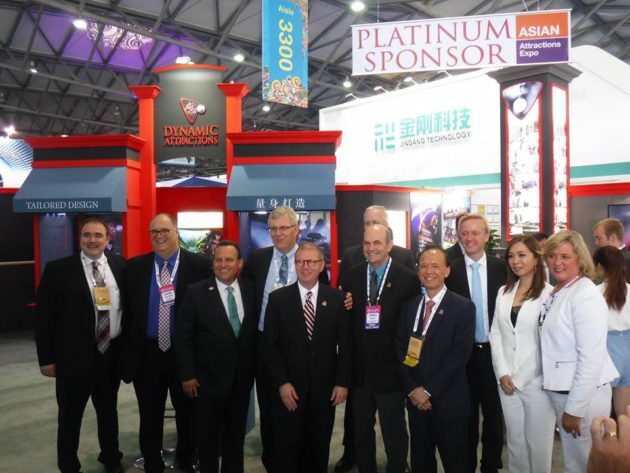 Owners, executives, managers, and leaders from the region’s theme parks, water parks, family entertainment centers, zoos, aquariums, museums, science centers, and resorts, as well as a number of developers and investors, participated in Asian Attractions Expo 2016. A record 414 exhibiting companies filled 12,339 net square meters of space making it the largest trade show floor in the event’s history. Exhibitors came from 34 nations and showcased the latest innovations for the attractions industry, including high-tech multiple-dimension motion simulators, virtual reality experiences, roller coasters of all shapes and sizes, next-generation video game concepts, immersive themed design elements and services, interactive water slides, and much more. The IAAPA Institute for Attractions Managers and IAAPA Safety Institute were well attended. The education conference at AAE featured industry leaders from around the world who addressed topics including: what’s new in Asia, implementing effective human resources strategies, creating risk management programs, and developing a business recovery strategy. 414 companies from 34 countries displayed new and innovative products across 12,339 net square meters of space, the most expansive exhibition floor in the Expo’s history. 8,100 qualified buyers from 79 nations met with industry suppliers, attended education sessions, and participated in networking events to find new ideas and learn about important trends in the industry. Attendance for the education conference was approximately 920, including more than 40participants for the IAAPA Institute for Attractions Managers; more than 130 attendees at theIAAPA Safety Institute. The Leadership Breakfast sold out at nearly 300 registrants and featured a keynote address by Jim Seay, ICAE, 2016 Chairman IAAPA Global Safety Committee, and President, Premier Rides. 100 people participated in a facility tour to Shanghai Ocean Aquarium. 400 people participated in the Opening Night Reception. 600 people registered for the sold out IAAPA Presents: A Magical Evening at Shanghai Disney Resort Thursday evening. 500 people registered for the sold out A Day at Shanghai Disneyland Friday. The Platinum Sponsor for Asian Attractions Expo 2016 was Dynamic Attractions Ltd. Gold sponsors were Arihant Waterpark Equipment, Brogent Technologies, Galasys, Goddard Group, Golden Horse, JRA,Pictureworks, Ripley Entertainment, and Wärtsila FUNA International. Silver sponsors, included Kraftwerk Living Technologies, ProSlide Technology, Scruffy Dog Ltd., and WhiteWater Waterparks and WhiteWater Attractions. Asian Attractions Expo 2017 will be held at the Sands Exhibition and Convention Center at Marina Bay Sands Singapore, 13-16 June, and advance exhibit sales are strong. Exhibitor information on the 2017 event is available on the IAAPA website. More detailed information on AAE 2017 will be available in late 2016.